This little guy is called the Ruby-throated Hummingbird. Every spring, he flies 500 or more miles non-stop across the Gulf of Mexico to spend his summer in the Eastern U.S. & Canada. He is commonly found in Georgia and throughout the Southeast, which serve as his breeding grounds during the summer months. When he leaves in the fall, he travels to ecologically diverse forests in Mexico, Central America and South America where he can find food and habitat to spend the winter. Shade-grown coffee farms provide some of this habitat. Increasingly in the 70’s, 80’s and 90’s, ecologically diverse forests throughout Central and South America have been clear-cut, often to grow large fields of one crop that is meant to be produced in large volumes. Some coffee is grown this way. This type of farming destroys the ecological diversity of an area, attracts pests and requires high-inputs of synthetic fertilizers and pesticides to keep crops alive. Shade-grown coffee is the opposite of that type of agriculture. It preserves ecologically diverse woodlands that provide habitat for hummingbirds (and other neo-tropical migratory birds), keeps chemicals out of coffee fields and away from farmers and local residents. It also allows the farmer to grow other trees & plants that can be revenue-generating, such as lime , cocoa, and avocado trees, or in the case of Guatemala, cardamom plants. All of the coffees used at Sweetwater and Cafe Campesino are shade-grown. 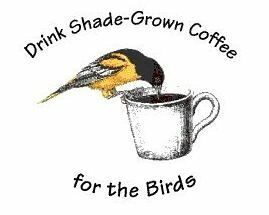 Cafe Campesino is proud to have partnered with the Atlanta Audubon Society to help raise awareness about the role that shade grown coffee plays in preserving habitat for neo-tropical migratory birds. Look for the Atlanta Audubon Society‘s special blend of coffee at AAS events, or purchase it online. Cafe Campesino gives 10% off all sales of this coffee to the Atlanta Audubon Society. Join the Atlanta Audubon Society or your local Audubon group on Field Trips to learn more about birds in your area.